Every once in a while, I run across a program that seems too good to be free--but truly is. Wise Registry Cleaner 7 (WRC 7 from here on in) is such a program. Actually, it's a bit more than a registry cleaner. It also defrags the registry and offers quite a few system tweaks under its System Tuneup tab. Simple, clean, and easy to use, Wise Registry Cleaner 7's interface would be top-notch if it were easier to see what it's going to clean. As a registry cleaner, WRC 7 has performed well for me. It always seems to find more stuff than CCleaner, another effective freebie that also removes other types of file detritus. The program checks ActiveX/Com components, software paths, application paths, shared DLLS, the Start Menu, etc. and removes any invalid entries. As with CCleaner, WRC 7 will get rid of some stuff you might want, including the most recently used file lists (MRUs) for Microsoft Office and other applications. It pays to spend a bit of time going through the list and de-selecting any items you'd like to keep. Also, there's a Safe Selections option if you right-click over any category heading. I suggest you use it until you're up to speed. WRC 7's registry defragger takes over your system for 30 seconds to a minute when it scans and runs to prevent other programs from making changes. It's a bit disconcerting the first time, but a nice precaution. It works quite well, though you may not notice a difference in boot times unless you've been running your Windows installation for quite a while. System Tuneup options include optimizing disk I/O, disabling the debugger, a few networking tweaks and some other stuff. They're easy to try and if you don't like them, you can click on system defaults to restore the Microsoft factory settings. If there's anything I don't love about the Wise Registry Cleaner 7, it's that the interface, which while attractive enough, doesn't allow resizing to let you see the entirety of some of the items listed. When you hover over each item, the full item displays as a tooltip, but still. Minor gripes aside, Wise Registry Cleaner 7 has worked perfectly for me. It's a permanent item in my toolkit. You should download it. 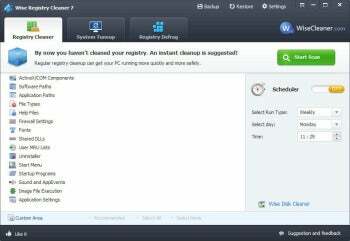 Super-effective registry cleaning and defragging (plus mild system tweaking) is Wise Registry Cleaner 7's forte.